I just got it to. The IPlogs was IPLOGS.exe. Any idea what it does, I couldn't find it anywhere else. I received this today too. This is the only place my search has turned up so far. 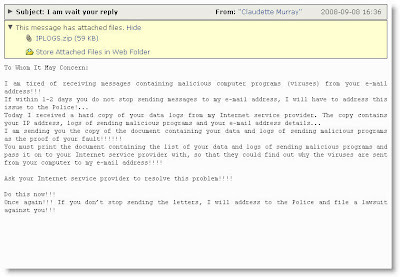 My attachment was IPLOGS.zip (not opened, of course)... and they can "wait my reply" all they want. lol. I just got it this morning. Like others, this is the only place I found anything about it. Mine was IPLOGS.zip as well. Like all of you, I too got this today and did not open it. I did some checking around. I always check the website address, you know the part after the @. So I can find out who to email to let them know about this illegal activity. And this time the website had a temp page saying it was disabled for violation of the hosts AUP. So I am not sending a copy of the email with headers before I delete it forever to the host so that they can investigate the matter.